Dr. Rivera’s first encounter with the powerful effects of chiropractic occurred when he witnessed the incredible impact that this natural form of health care had on his mother, who had severe scoliosis. A week or so after she received chiropractic care she had no pain or discomfort. Dr. Rivera graduated from Life University in 1998, and he holds chiropractic licenses in both Georgia and Puerto Rico, where he is from. 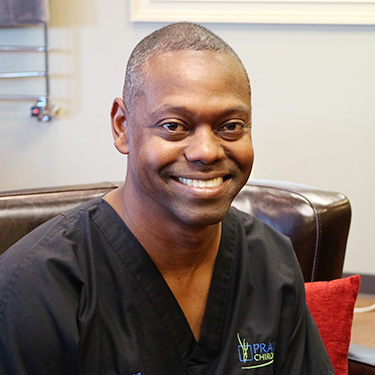 He is an expert spine adjuster of all ages, experienced with treating a wide variety of injuries, including auto accident and workers’ compensation, as well as routine wellness care. He is fluent in Spanish and English and practices in the Dalton office. In addition to being a chiropractor, Dr. Rivera has served in the military since 1990 and has had multiple deployments. While deployed in Afghanistan, he helped relieve headaches, neck and back pain that many military personnel there were experiencing. Now back home in Georgia, Dr. Rivera is a member of the United States Army Reserve, sacrificing one weekend a month to attend trainings. Dr. Rivera and his wife Jacqueline have four sons, including a set of twins who love to play baseball. Contact Pray Chiropractic today to book an appointment with Dr. Rivera!